I’ve wanted to write this blog post for a while now. Ironically I’ve simply not had the time. I wanted to go through Vegan Street Food with a mindset of only having fifteen minutes to cook something. And then I could highlight some of the best recipes for those hungry times (of which there are many) that I want something nice to eat, and quickly, that’s not toast. The times when I’m trying to juggle several tasks and then realise I’m really hungry and lunch or dinner is well overdue. I think we are sometimes put off making the most of our cookery books (again, of which I have many) because our busy lives get in the way. But it definitely shouldn’t get in the way of making something delicious to eat. There are many times I do enjoy cooking from a long and complex recipe, as I know the results might be amazing and I like the way that more complex cooking slows me down from my usual frantic pace. But equally, there are times where ease and simplicity are far more important. The recipes in Vegan Street Food are focussed around travel, but that doesn’t exclude highlighting the quick and easy recipes in hindsight now. It was while talking to my sister (who really doesn’t cook much, and would much rather bake a cake) that I realised that some recipes in Vegan Street Food might be quite daunting to a new cook. We can all feel overwhelmed by recipes at times, especially when faced with new flavours and ingredients, but it struck me that a little guide to the best 15 minute recipes in Vegan Street Food could be rather useful. Either as a quick guide for a much improved lunch break or easy midweek dinner, or as the path of least resistance for the new or reluctant cook (yes that’s you sis). 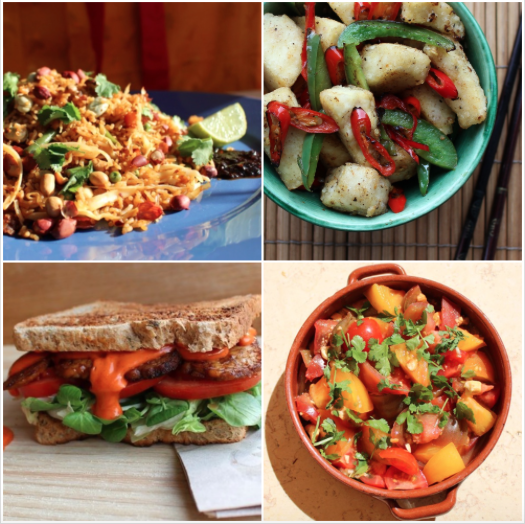 So here is my guide to the savoury recipes from Vegan Street Food that can actually be made in fifteen minutes or less (not including walking to the shops for your veg and spices of course). There are plenty more that can be made in 30 minutes, but I’ll save that for another post. In the India section, there are a couple of elements that can be extracted from a bigger recipe, that make a perfectly substantial meal. The Aubergine Masala on p45 works great as a stand alone curry to eat with rice or roti, as does the Spinach Masala on p59. This is my personal favourite, and the photo above was a snapshot of my 15 minute lunch, served on a methi roti with a dollop of coconut yoghurt. If you have left over roti, chapatti or paratha, then Sri Lankan Khottu Parotta on p82 is great for using up leftover vegetables too. Thai food is great for nailing quick and delicious food. Holy Basil with Aubergine (p101), Glass Noodles with Cashews & Chilli (p111), Mung Bean Noodle Soup (p120) and my fusion favourite Marmalade Tofu (p115) are all very quick and easy to make. Som Tam salad (p119) can be made within the time, and doesn’t have to be time consumingly rice paper wrapped (although this technique does get easier with practice I promise!). With some practice, Pad Thai Jay (p98) can be made in 10 minutes. But to be fair, it’s more of a 30 minute dish for most. Both Vietnamese Claypot Mushrooms (p147) and Siam Soup (p136) are quick to make and substantial too. The latter is a regular mid week dinner in our busy household, and both my teens have learned to cook this, as well as the Mung Bean Noodle Soup, which will hopefully get them through some hungry student days at University later this year. Vegan Street Food has now been reprinted so it's back in stock at Wordery and Amazon. There are also a handful of recipes on the website that fall within the fifteen minute deadline. I might have to endeavour to create a few more recipes like these, and make all our lives a little easier.